I wanted to share disease updates and UGA recommendations, for peanuts, cotton, and soybeans. Please call me if you have any additional questions. Peanut: We have experienced a couple of weeks of ideal conditions (very hot temperatures & scattered rainfall) for leaf spot diseases and white mold. In order to protect the crop during this critical time, it is important that we be effective with our fungicide applications, by following a timely and appropriate fungicide program. I have included a link to Peanut Rx Programs for the companies that provide them (BASF, Bayer, DuPont, Nichino, & Syngenta). We should be monitoring fields and be prepared for white mold outbreaks. If you have missed the afternoon thunderstorms and are experiencing the other extreme of dry weather, keep in mind that white mold control can be more difficult during drought. This is due to the fact that, dry weather prevents the ease of movement of the fungicide product from leaves of peanut plant to our target application spot in the crown of plant. To ensure white mold control products get down to crown/ground; irrigate if possible or apply white mold control fungicides with presence of dew on peanut plant and/or while leaves are still closed up. Of course, always use caution with tank mix applications, during extreme hot and dry weather. The likelihood of plant burn can increase with any product, with the increase in environmental temperatures and tank mix partners. 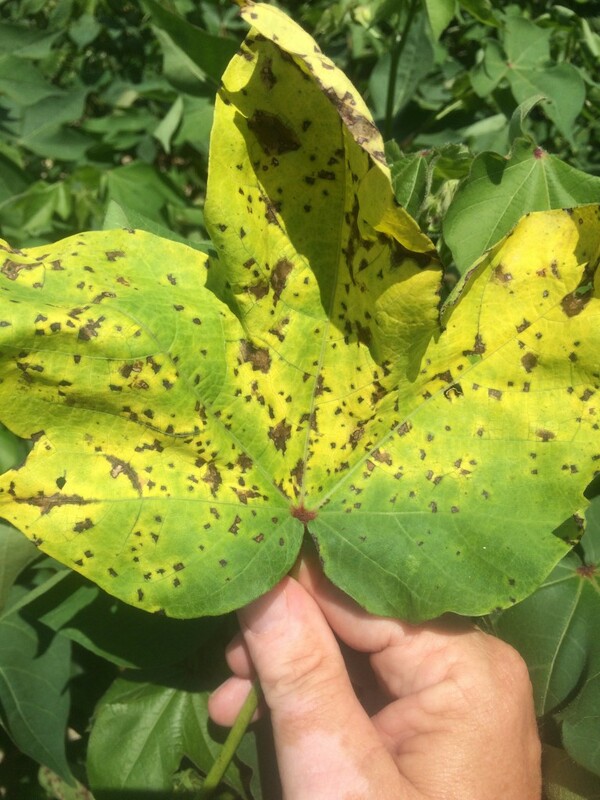 Cotton: If you have cotton field(s) with vigorous/excessive growth, be on lookout for Target Spot. If you have a rank growth cotton field and/or where this disease has been a problem in past, consider fungicide disease management options. An application of fungicide for target spot is most effective when applied in the early weeks of bloom. Dry land fields or those experiencing drought conditions are not likely to be as affected by target spot or benefit from fungicide applications. Also, Bacterial blight has been found in cotton. Please refer to picture below for leaf characteristics associated with this disease. Although there is nothing that we can apply to control or manage this disease, reducing leaf wetness periods by carefully managing growth of crop and irrigating at night, may help slow progression of disease. Also if Bacterial blight is found in field, it is important that we note field locations and varieties. So we can note varieties most affected and assist with crop management decisions for next season. Soybeans: If our soybean crop has good yield potential it is recommended that we protect this crop, no later than early pod set, against asian soybean rust. With the more frequent afternoon thunderstorms in our area, we increase the likely movement and progression of this disease into our area and fields. For more cost effective application, fungicide applications can be timed with Dimilin and boron applications. Posted in Cotton, Disease Control, Peanuts, Soybeans. Bookmark the permalink.